The Romanian Revolution was a period of violent civil unrest in the Socialist Republic of Romania in December 1989 and part of the Revolutions of 1989 that occurred in several countries. The Romanian Revolution started in the city of Timișoara and soon spread throughout the country, ultimately culminating in the show trial and execution of longtime Communist Party General Secretary Nicolae Ceaușescu and his wife Elena, and the end of 42 years of Communist rule in Romania. It was also the last removal of a Marxist-Leninist government in a Warsaw Pact country during the events of 1989, and the only one that violently overthrew a country's government and executed its leader. 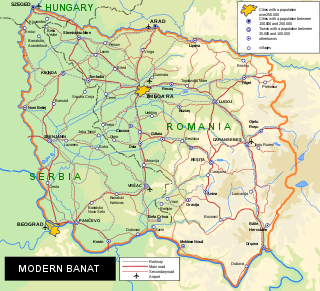 The Banat is a geographical and historical region in Central Europe that is currently divided among three countries: the eastern part lies in western Romania ; the western part in northeastern Serbia ; and a small northern part lies within southeastern Hungary. 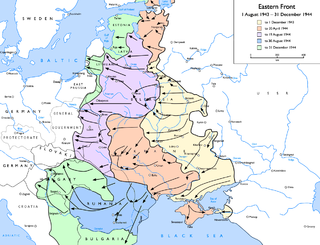 After the Allied armistice with Romania (11–12 September 1944), the Red Army had free run in Romania and the Romanian government did not have authority over Northern Bukovina. In late 1944 and early 1945, some small armed groups were formed in Romania, with a mission of harassing the Red Army in a future war between the Soviets and the West. 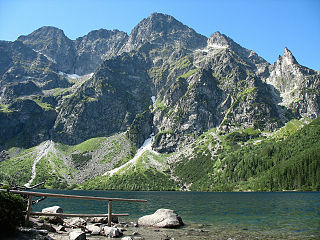 After the war, most of these groups dissolved while others remained in the mountains until 1948, when they became active. In May 1946, General Aurel Aldea, the former Minister of the Interior of the Sănătescu government, was arrested and charged with "bringing together various subversive organisations under his command". It appears, however, that the "National Resistance Movement", which he coordinated, posed little threat, if any, to the establishment of the communist regime. Aurel Aldea was a Romanian general and anti-communist resistance leader. Constantin Sănătescu was a Romanian statesman who served as the 44th Prime Minister of Romania after the 23 August 1944 coup, through which Romania left the Axis Powers and joined the Allies. After the elections of 1946, a coalescence of anti-communist forces led to a structure reuniting generals, senior officers and politicians preparing and coordinating armed groups under a single command. The central coordinating structure inside Romania reported on this initiative to the Romanian National Council residing in Paris, which in turn informed the Western governments. The project was eventually intercepted by the Romanian authorities, which subsequently carried out massive arrests in spring 1948, comprising up to 80% of those who were implicated in the movement. Thus, the coordinated national resistance was decapitated. Corneliu Dragalina was a Romanian General during World War II, the son of the World War I-general Ion Dragalina. He was also a recipient of the Knight's Cross of the Iron Cross. He was commander of the 6th Army Corps (Romania) from 1940 to 1943. The members of the armed resistance were not called "partisans" by the population, but haiduci ,  a word for the generous highwaymen, considered folk heroes. Ion Gavrilă-Ogoranu, a member of the Iron Guard's youth wing who led a resistance group in the Făgăraş Mountains from 1948 to 1956, and remained undetected until 1976, worked out a set of defining traits of the typical Romanian resistance group. According to this author, such a group was rather small, but could number up to 200 men, located in a mountainous/forested area which comprised some communities. Ogoranu further claimed that such groups were supported by a significant number of inhabitants (up to several thousands), who provided shelter, food and information. Dispersal, extent, and duration of the resistance rendered research after 1990 more difficult in ascertaining structural information on the movement. Evaluating the archives of the Securitate the CNSAS (National Council for the Study of the Securitate Archives) has assessed a provisional figure of 1196 resistance groups acting between 1948 and 1960. The size of the groups varied from small groupings of less than 10 members to intermediate sized groups counting around 40 fighters up to larger detachments of more than 100 men, with the highest distribution density placed around a strength of 15–20 men. According to these assumptions, the total number of active resistance fighters may not fall below 10,000 persons, with an estimated figure of at least 40–50,000 supporting persons. The number of killed victims on the insurgents' side could be established according to both archive data and various memoirs published after 1990. The archives revealed several hundreds of death penalties, yet a much larger number of resisters have been killed either in battle or during different phases of detention. An estimated figure could amount 2,000 lost lives. Rather than a planned action, the resistance movement was a spontaneous reaction in response to the wave of terror initiated by the authorities after the seizure of power in early 1948. The spontaneous nature of the movement explains its marked fragmentation and the lack of coordination between the resistance groups. However, acting isolated and on a local basis conferred the groups a multiformity and flexibility which rendered the annihilation of the entire movement more difficult, and ensured a remarkable staying power for some groups. Furthermore, in some areas a notable reproducibility occurred, exterminated groups being replaced by new cores of resistance. Leonte Tismăneanu was a Romanian communist activist and propagandist. Lisa is a commune located in Romania, Brașov County, in the Făgăraș area. It is well known in the area for its winter holidays customs. During the Soviet occupation, the religious life in Bessarabia and Northern Bukovina underwent a persecution similar to the one in Russia between the two World Wars. In the first days of occupation, certain population groups welcomed the Soviet power and some of them joined the newly established Soviet nomenklatura, including NKVD, the Soviet political police. The latter has used these locals to find and arrest numerous priests. Other priests were arrested and interrogated by the Soviet NKVD itself, then deported to the interior of the USSR, and killed. Research on this subject is still at an early stage. As of 2007, the Christian Orthodox church has granted the martyrdom to circa 50 clergymen who died in the first year of Soviet occupation (1940–1941). Camil Bujor Mureşanu was a Romanian historian, professor, author, and translator. Dumitru Coroamă was a Romanian soldier and fascist activist, who held the rank of Major-General of the Romanian Army during World War II. He was especially known for his contribution to the 1940 establishment of the National Legionary State by the far-right Iron Guard, with which he had been secretly involved for a decade. After beginnings as a schoolteacher in his native Neamț County, Coroamă had become an officer of the 15th Dorobanți Regiment, first earning distinction during World War I. Coroamă helped organize the defense of Western Moldavia, then participated in the Hungarian–Romanian War, establishing Romanian control in Bistrița and Baia Mare. He received the Order of the Star of Romania and the Order of Michael the Brave. 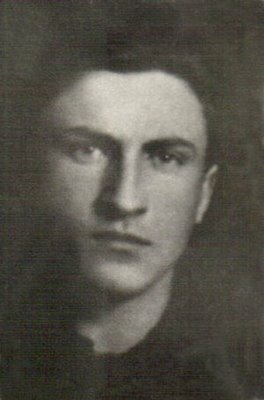 Valeriu Graur was a political dissident of Bessarabia, a member of the National Patriotic Front of Moldova. Olimpiada Bodiu was a Bessarabian activist in the former Moldovan SSR. Elena Postică is a historian from the Republic of Moldova. Ștefan Ciobanu was a Romanian historian and academician, author of some important works about ancient Romanian literature, Romanian culture in Basarabia under Russian occupation, Bessarabian demography, fervent advocate of the introduction of the Romanian language in the schools of Bessarabia, vice-president of the Romanian Academy between 1944-1948. He served as Minister of Education (1917-1918) of the short-lived Moldavian Democratic Republic. Gabriel Andreescu is a Romanian human rights activist and political scientist born on 8 April 1952 in Buzău. He is one of the few Romanian dissidents who openly opposed Ceauşescu and the Communist regime in Romania. Vasile Bătrânac was the head of the anti-Soviet group Arcaşii lui Ştefan and a political prisoner in the Soviet Union. Major Nicolae Dabija, knight of Order of Michael the Brave, was an officer of the Romanian Royal Army and a member of the anticommunist armed resistance in Romania. He was the leader of the resistance group The National Defense Front - The Haiduc Corps. Sîdîyîk Ibrahim H. Mîrzî (1909–1959) was a Crimean Tatar spiritual leader, imam, Mufti of the Muslim community of Romania, and activist for ethnic Tatar causes. The "Everything for the Country" Party was a political party in Romania. Founded in 1993 by former members of the fascist Iron Guard, the party claimed to adhere to a "national-Christian" doctrine and styled itself as the successor to the interwar party of the same name. It was banned in 2015. Constantin D. Nicolescu was a Romanian career army officer. Radu Paladi was a Romanian composer, pianist, and conductor. His compositions include stage and film music, choral works, vocal music and vocal-symphonic works, chamber music, symphonic music as well as concertos. Nicolae Alevra was a Romanian brigadier general and politician who held was Minister of Communications in the first government of Iuliu Maniu. ↑ Totok, William; Macovei, Elena-Irina (2016). Între mit şi bagatelizare. Despre reconsiderarea critică a trecutului, Ion Gavrilă Ogoranu şi rezistenţa armată anticomunistă din România. Polirom. pp. 103–104, 179–180. ISBN 978-973-46-6127-5. 1 2 3 4 5 6 7 8 9 10 Din istoria rezistenţei anticomuniste in România, Adrian Stǎnescu, Curierul Românesc , Year XVI, number 5 (208), May 2004, pages 8-9.